Whether you’re choosing a diamond solitaire, a ring with a number of stones, or an open-work lattice ring in which the diamonds flow along the lines of the setting, the way the stones are held in the setting is an integral part of its design. Each setting technique creates a look that is part of the overall style of the ring. You may like one ring rather than another simply because of the setting technique used. 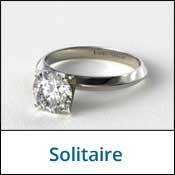 A prong setting is the one most often used to hold a solitaire. 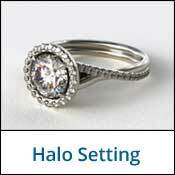 A prong setting puts the emphasis on the diamond and not the metal supporting it. The purpose of any setting is to hold the diamonds securely in the mounting and at the same time allow light to enter the diamonds for maximum brilliance. This is obviously a delicate balancing act. The more metal used to hold the diamonds, the more secure they are; the less metal used, the greater the chance for the diamond to reflect light. Very thin wires of gold or platinum (the prongs) are used to hold the diamond securely in place. The diamond may be raised high up above the shank, to give it a larger, more important appearance, with only a suggestion of metal showing. 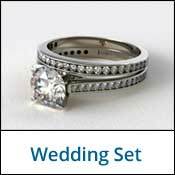 In such a setting, the prongs are attached to the central setting of a ring, known as the head or basket. Each prong extends upward and outward from the head, arching over the diamond to form a secure grip. The ideal prong tapers to a rounded point. The prongs should be placed at the key points of the diamond, typically at four corners or at four, five or six points evenly spaced around the stone — this diamond setting offers security without interfering with the stone’s brilliance. The prong setting can also be found in a few variations. One such variation, called the V-prong setting, functions on the same basic concept, but it uses prongs which, when viewed from above, appear to be curved into a V-shape. The right angle of the wire is cut to allow the corner of the gem to rest and be held by the wire. V-prongs are generally used for diamond shapes with points — such as the corners of the square Princess Cut or the tip of the pear shaped diamond. The v-prong provides additional protection to the points which are often thin, fragile, and subject to chipping if left exposed. Another variation on the prong setting is called the common prong. Here, the metal wire is grooved at the top, and is used to hold two gemstones by their side (girdle). This technique is used to give a close side-by-side gemstone relationship without the metallic interference of too many prongs. 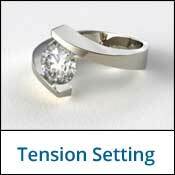 A bezel setting is a collar of precious metal that wraps around the diamond. The bezel is attached to the top of the ring and stands up above it, adding height and another dimension to the setting. Although solid bezels have a very traditional look, the bezel may be ‘split’ into two sections, arcing around just part of the diamond. This is called a half bezel. This simple change suddenly opens up the setting and gives it a totally modern look. The technique may also be used on a fancy cut diamond — with an arc of precious metal around the wide curve of a pear shape and another, V-shaped section of precious metal embracing the narrow end. Channel setting is also used to set round diamonds. 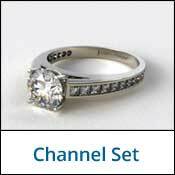 Channel setting offers a sleek, elegant appearance, though the end result is a very different look. Setting round diamonds into channels leaves small spaces closest to the metal bars of the channel. By choosing round diamonds, the designer creates a clean line of stones, yet one with greater brilliance than is possible with baguettes. 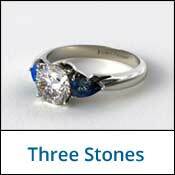 This also offers a less restrained look, and may be more suitable when a ring has a round center stone. 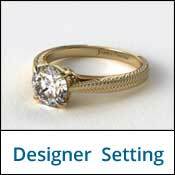 Channel setting is also used when there is no center stone at all. The placement of baguettes around an entire band is a beautiful choice for a wedding band, one that goes well with a matching ring set with a diamond solitaire. Channel setting protects the diamonds extremely well. None of the edges are exposed, and so they are not subject to hard knocks or general wear and tear. A variation of the channel set is called the bar channel. Here, the metal plates rise to top level of the stone, and so are visible between the stones. This gives a slightly different visual effect, and can be very striking if the contrast between the metal and the stone is significant. When the surface of a ring appears to be covered with tiny diamonds, the technique is called Pavé which means paved. It’s an apt name because the surface looks a bit like a very pretty street paved with cobblestones. Tiny diamonds are placed in small holes that have been drilled out of the ring shank. On a band that does not taper across the top, each diamond should be exactly the same size. The diamonds are placed in rows, but in such a way that they fill as much of the space of the surface as is possible without actual touching. The more precisely cut the diamonds, the better the final appearance of the ring. Each tiny diamond, weighing just a few points, is fully cut with 58 facets. Though small in size, each stone contributes to the overall, shimmering look of the design. After it is positioned in its hole, tiny bits of metal from the surface of the shank are pushed over the edge of the diamond, forming tiny beads to hold the stone in place. The same beading technique may be used on a ring in which the diamonds are spaced slightly apart. In this instance the gold work is much more of a statement and a design element. These beads, larger and more prominent, may be engraved or decorated. The diamonds may also be slightly larger in size. By varying the size of the stones and the size of the beadwork, the designer creates a totally different look. Consider the impact you want your ring to make. Are you looking for the dazzling glitter of tightly set Pavé — or the more decorative look of bead-set, larger diamonds? Both are beautiful, and the choice is yours. The cluster setting is another variation on the theme of choosing a ring with a number of smaller diamonds. There are cluster rings with the stones arranged in the form of a stylized flower, or those done as an abstract arrangement of stones. Cluster rings are usually multi-level, with considerable height above the hand. The arrangement of stones can be quite open and airy looking, or it may be more tightly arranged. The choice is a matter of taste, but the shape of the finger can also play a role in making that choice. Remember that the openwork design lengthens the look of the finger and the hand, while the more closed design draws the eye toward the hand. The flush setting is one of the subtlest diamond-setting techniques. Stones are sunk into the mounting until they are nearly level or flush with the surface. Only the table of the stone and a bit of the upper pavilion facets show. This technique seems to go against everything we know about diamonds in relation to light, but it’s become quite a popular setting. It’s a very subtle look, and one that appeals to the woman who likes the idea of tiny, glittering bits of light twinkling like stars in the sky. The flush setting is also used for larger stones, offering great protection and a modern look. One of the classic multi-stone ring designs, the ballerina, derives its beauty from the placement of tapered baguettes which flow around a center stone to form a ‘tutu’, that short flared skirt worn by ballet dancers. There are ballerina rings in which baguettes are set in an undulating curve that literally emulates the tutu skirt of a dancer.